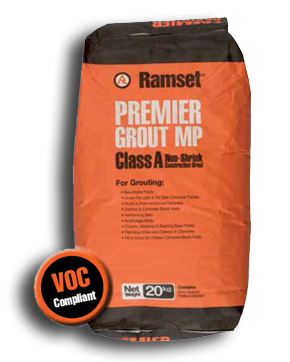 Premier Grout MP is a Class A, non shrink cement grout that complies with AS MP20, Part 3 (1977). The product consists of a speciality blend of cement, graded aggregate and other chemically reactive agents that compensate for drying shrinkage commonly found in cement products. Premier Grout MP does not contain any ferrous material or Calcium Chloride. High strength Premier Grout MP will not shrink making it ideal for filling holes and voids in concrete for installing and repairing posts, bolts, pipe penetrations or structural underpinning. Ready to use, pre mixed, requires only the addition of water.